Like Christmas, Loy Krathong is a perfectly lovely Lanna festival that has gotten way out of control. Probably of Hindu origins, it marks the occasion on which the Thai people express their gratitude to the “Mother of the Waters”: the system of rivers, channels, and canals that shape inland Thai life. It is now, however, a threat to life, limb, and sanity. 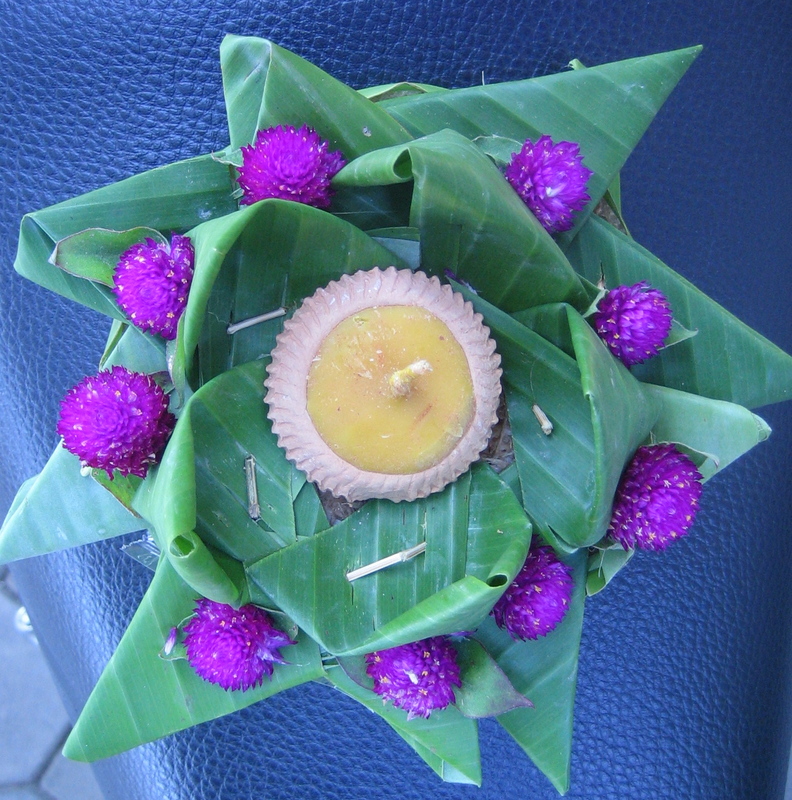 “Loy” means “to float” and a “krathong” is a small craft shaped like a lotus flower, about one’s hand’s-span wide, made out of a banana tree sliced horizontally and covered with banana leaves. 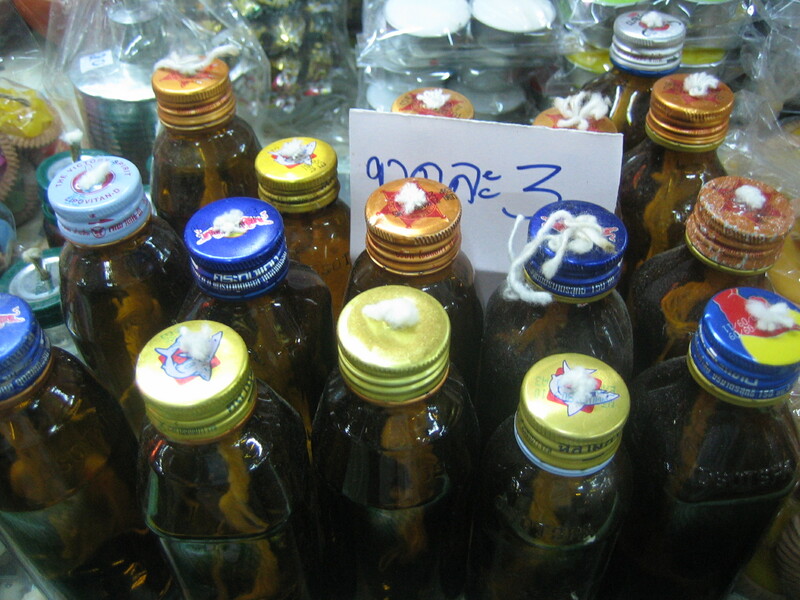 They bear careful arrangements of flowers, candles (or lamps made out of amphetamine drinks), incense, and coins, and can be made at home or at school, or bought riverside. You carry your krathong down to the river, or your canal or what have you, light the candles and incense, and set it free on the gentle current along with your wishes and hopes. In the North, Loy Krathong also involves the Festival of Lanterns, in which people decorate their homes and businesses with paper lanterns. 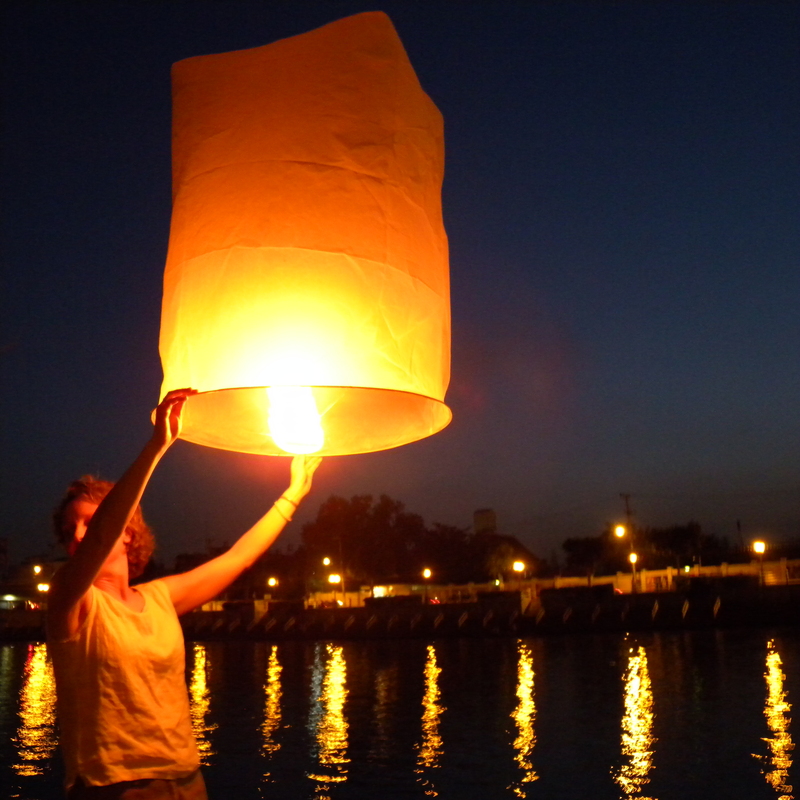 At night, people send off sky lanterns, or fire balloons (khom loy): enormous paper cylinders like hot-air balloons, closed off at the top, with a tight disk of cardboard fuel, which is suspended in the center of the lantern’s base and held in place with very thin wire. You light the fuel, hold the lantern balanced (so that the sides don’t scorch), wait until it is pulling itself out of your hands, and release it so it can rise into the night sky and fly away to join the other lanterns. What could be more beautiful, she asks rhetorically? The river banks full of people sending gentle wishes and peaceful, (mostly) biodegradable offerings downstream, creating currents of flickering golden candlelight along the dark waters? An autumnal night sky filled with hundreds and hundreds of khom loy, glowing red as they rise towards an enormous harvest moon? The traditional songs and costumes brought out for the festival? Ah, but the Chinese know how to make it even better. Perhaps because of Hindu origins—Loy Krathong might be linked to Deepavali, the Hindu festival of lights—or because we’re just so darn close to China, and have a significant Thai-Chinese population–you can’t have a festival of any kind without fireworks and firecrackers. In recent years, however, with a flood of cheap fireworks from China, Loy Krathong has become an explosive free-for-all, with people setting off fireworks all night long on the river—ideally directed at the people on the opposite bank or passing boats—beginning long before Loy Krathong proper. Some of these are ordinary bottle rockets, some of them are just plain old poppers, and some of them are full-on, multiple-stage explosives that no amateur should be allowed to touch. And so Loy Krathong has become three consecutive performances of Fireworks Amateur Night, prefaced by weeks of warm-up rehearsals. We gritted our teeth through almost a month of late-night whistle-rockets, decorative flares, the strings of traditional Chinese firecrackers, and the occasional percussion-mortar, preferably set off on a tin roof for maximum noise. They would start at dusk, and carry on until three or four AM. 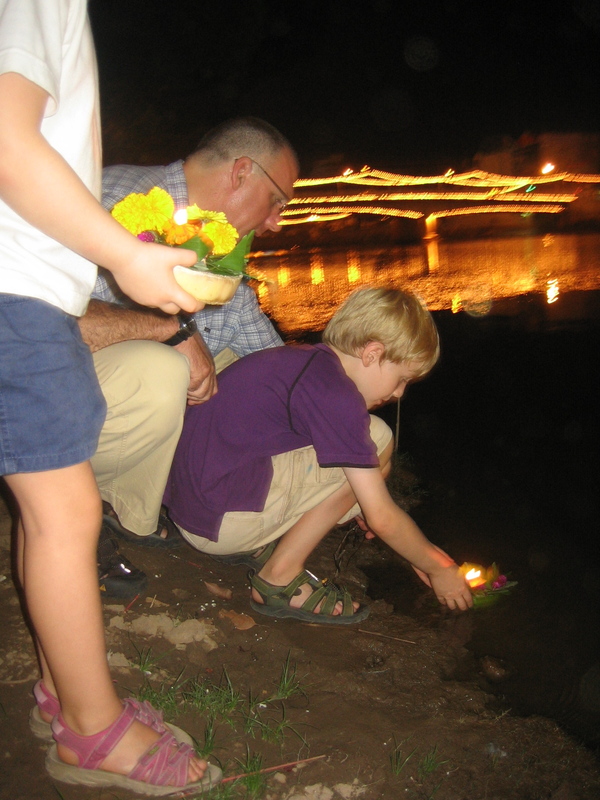 We had so long anticipated viewing Loy Krathong from our seventeenth-floor balcony, overlooking the river bank between Kaeo Nawarat and Thanon Tha Phae—ground zero for Loy Krathong—that we thought we could put up with the disturbances for a while. After all, we had no choice. 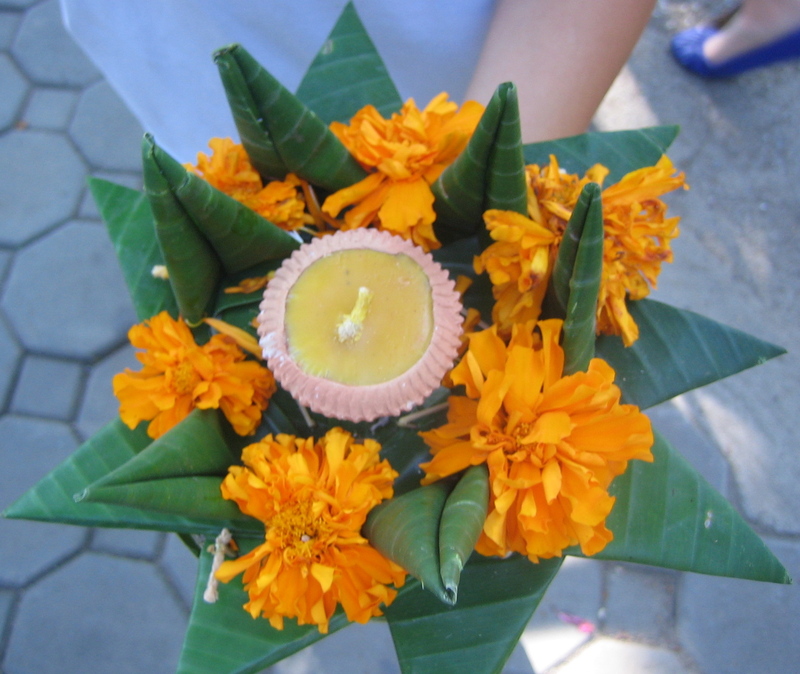 But at one point, still ten days away from Loy Krathong proper, I began to worry about my health. I needed to nap at 9 AM; I could not keep a single thought running in my mind at any time; I was snappish and sluggish and peckish. Being part of a family much given to medical anxiety, I wondered if I was depressed, or if I had contracted some lingering respiratory infection (we’re still coughing up the Indonesian haze). And then I realized that I had simply not had a decent night’s sleep in weeks. How simple, and now we just needed to wait the festival through. Our photographs of the madness all turned out badly, our camera gear not being up to the challenge. Far better is this snippet of video we took from our balcony. If you look between the edge of the river and the reflection of the strings of light, you can see the golden flickers of the krathongs on the water. The video communicates only a bit of the chaos and endless noise—look for the khom loy rising in the sky and listen for the car alarm that gets set off by a percussion mortar—and it was taken before things really began to heat up, when we still felt relatively safe on the balcony railing. Note that traffic hasn’t been closed off yet, either. While this in itself might seem tolerable, this sound-and-light show went on all night, for three nights straight, and into the fourth as well. We drew the blackout curtains—surprisingly helpful—turned on the air-conditioning and fans for white noise, and inserted earplugs, more as a psychological gesture than anything that would actually provide silence. The other sound we heard regularly was the wail of ambulance sirens. We can only figure that one day, enough people will get hurt that the government might outlaw the amateur fireworks, or at least fireworks of a certain magnitude. It worked in Vietnam, where dozens of people were killed each year during Tết celebrations, until the government banned them in 1995. It’s not sanuk, but it also might draw in more people who quite sensibly fear going out into this madness. We brought the children down to float their krathongs and their khom loy the night before the festival formally began, and they were relieved not to be down in the free-fire zone around the building. Both of them, fortunate little souls, slept through it all, three nights running. 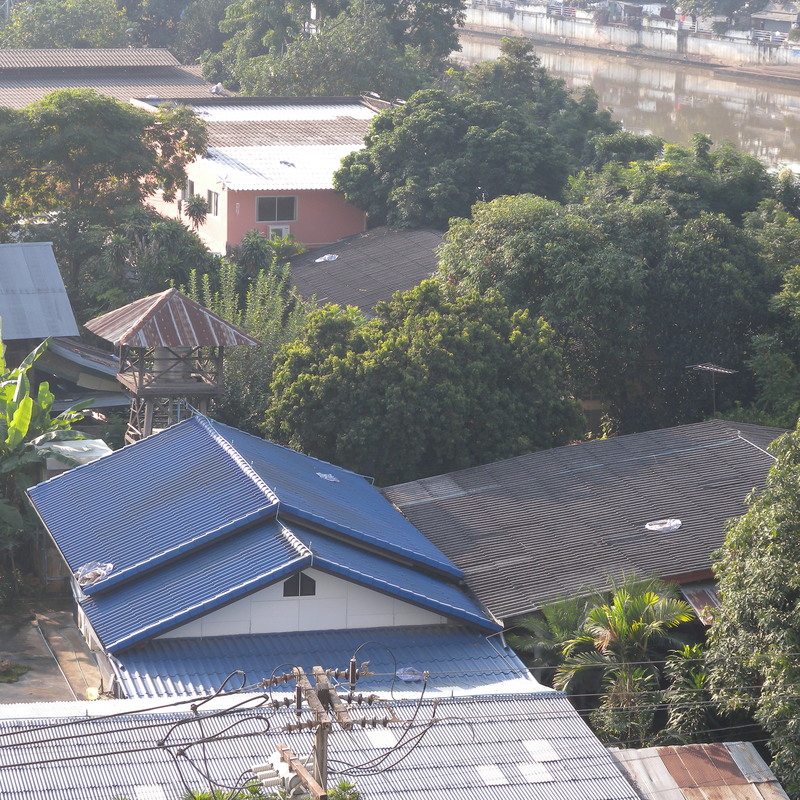 On the way to school—accompanied by the sound of skyrockets and ground-spinners still being set off—they cheerfully pointed out all the smoke-stained khom loy that had descended after their fuel burnt out. Looking like nothing so much as used condoms, the shells were draped over the trees and roofs, and many remain. Bleary-eyed and speaking sleep-deprived nonsense to each other, Ken and I contemplated the armies of municipal workers and high-school volunteer scouts who came out each dawn to clean up the debris of the night before. Then we made more coffee, and listened to the noise of the construction site across the street. Sounds like Burning Man! Amazing that they have the stamina to party all night long for weeks and weeks.